One of the most important characteristics that an experienced web marketer must have is the ability to be well-rounded. In other words, if you want to make websites more successful than ever, you need to make absolute sure that you understand all aspects of web marketing, including SEO, local search, and today’s topic, paid search marketing. Unfortunately, while SEO and local search have many things in common, paid search is a different beast entirely that takes a different way of thinking; thus, an understanding of the basics is required. So, what is paid search marketing, and how can it help your website succeed? At its core, paid search marketing has similar goals to SEO; you are simply trying to make your site more visible in the digital world. However, it is the way you go about it that is completely different. Unlike SEO, where you “optimize” your site so that Google and other search engines display your entry on their search engine results page (SERP) organically, paid search means buying Pay-Per-Click ads (the standard way ads are paid for) from Google. This means you only pay when someone clicks on your ads, not when your ad is displayed (referred to as “impressions”). The ads are displayed based on the keywords you choose (via keyword research) and thus are directly aimed at those you wish to target, making paid search an incredibly powerful tool in the internet marketing world. Now that you have an idea of what paid search is, you probably are chomping at the bit to get started; yet, there is one big thing we have to get out of the way before we do so, the proverbial elephant in the room, if you will. We already mentioned pay-per-click (PPC) as the main ways you will pay for the ads you receive, but you may be wondering what these terms mean. In just a few words, these mean that you will be paying for every click that you get and, if you end up getting a lot of traffic or if you bid a lot on the keyword you want (more on that later) then this will end up being a very expensive endeavor. Now don’t get us wrong; we aren’t saying that you should underpay to get your ad space on Google—in fact, we are asserting quite the opposite. But, it’s still a thing you will have to keep in mind before jumping into a paid search campaign. Create an AdWords Account: The very first thing you need to do is create a Google AdWords Account if you don’t already have one. 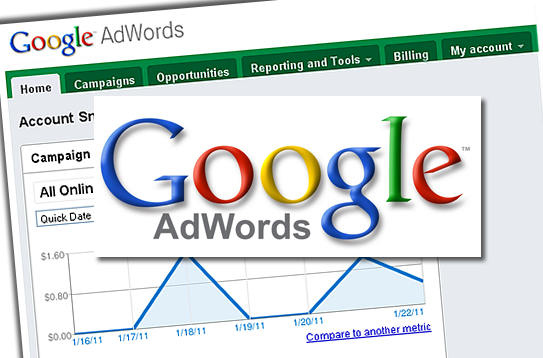 Fortunately, this is definitely the easiest part of your journey; simply visit Google’s AdWords site and set up your account with all of the important information. And don’t forget, you need a basic Google account as well before fulfilling this step. If you don’t already have one, you may simply create a free Gmail account here. Once here, click the “Create your first campaign button”; this will bring you to your first campaign homepage, where you will select your campaign settings. Modify Basic Settings: Next on your agenda is to set up the campaign the way you want to (and the way that is certain to give you the most organized and best information for you). First, change your campaign name to something more specific to the site you are advertising for; this will help in the future if or when you decide to create more advertising campaigns. Type: This option refers to the “type” of campaign you wish to run, and you will get to choose between “Search Network only,” “Display Network only,” “Search Network with Display Select,” or “Shopping”. For now, pick Search Network with Display Select; this allows you the most freedom and ensures that the most people will see your ads. Sub-Type: Directly to the right of the drop down “type” menu, you will see two options for “Standard” or “All Features”; this is the sub-type, and is very important to the rest of your campaign. The first option—Standard—should already be selected, and offers basic services for the AdWords beginner, including basic location targeting, basic bidding and budget settings, common ad extensions, and language targeting. If you prefer a simple overview, one that doesn’t seem too technically complicated, it may be best for you to pick the standard campaign. But, if you want all the information possible—which we certainly recommend—use “All features”; this will provide you with extreme customizability and all of the information/data you could ever need about your ad-campaign. Remember; if you pick all features, you need a Merchant Center Account linked to your AdWords. Bid Strategy and Budget: On the same page, you will notice a section containing options for Bid Strategy and Budget; this is where you decide how much you will bid for the keywords you choose and the max amount you can spend daily (your “bid strategy” and “Budget” respectively). Remember; your ads’ prioritization on Google’s webpages will depend on how much you spend per click you receive, and you are competing with the rest of the web for priority placement. In other words, if you spend the most money on the keywords you desire, you will end up in the best place possible when someone searches for those keywords. If you don’t, well your ads might never see the light of day. For now, simply set the budget as high as you are comfortable paying and do the same thing with what you will be paying per click (click “I’ll manually set my bids for clicks” in order to make this a possibility). Ad Extensions: If you want your ads to feature extra information about your business, such as location, extra site links, and your phone number, these ad extensions can be extremely useful. Best of all, they are free! We highly recommend selecting all of these options, then click Save and Continue once you are satisfied with your initial campaign settings (you can come back to change them later once your campaign is in full swing). Create Ad Groups: Now that your campaign has the settings you want, it’s time to actually create your ad and determine what those ads will be targeting. As you see, there’s a headline, two description lines, a display URL, a Destination URL, and a place to fill out your keywords; all of these need to be filled out to the best of your ability to make absolute sure your campaign is a hit. After all, even if you spend the most money and have the best keywords, if people don’t like the ad that they see, they aren’t going to click on it; thus, make sure your headline and descriptions are targeted towards the audience you are going after, and make even more certain that your ad doesn’t seem spammy. No one likes spammy ads, and you won’t make any money off of an ad that seems like it’s simply trying to game the search engine. Oh, and one more thing; you can create more than one ad group for your campaigns. Actually, we highly suggest doing so for the sake of A-B testing (i.e. so you can see whether or not your keywords/ad copy is truly working for you). With more than one ad group, you can cover more ground, work with more keywords, and narrow down what isn’t or is making you money; it may be expensive, but it will help you in the long run. Choosing your Keywords: Besides money, the main key to making sure your ad gets seen (and clicked on, of course) is running a successful keyword research campaign. Fortunately, we’ve already written a nice and long keyword research blog post to help you determine precisely what keywords your campaign will need! Remember; be thorough, use the long tail, and make certain you know how expensive each click may be by adding a max CPC to the keywords you find using Google’s Keyword Tool. Once you find the keywords that work for you and your site, simply plug them into the keyword section (10-20 should be good for now) and save your campaign. Then, set up your billing information and your campaign is ready to start making you money! Watch and Tweak: As the days go by, you may notice that you are or aren’t making money on one or more of your ad groups that you have created; this is where tweaking and your Return on Investment come into play. Keep in mind that if you aren’t making conversions off of a certain ad group or if your campaign simply isn’t making you money, then it’s perfectly okay to go back and find new keywords or switch up your bidding options so you can find what fits for you. The only reason you are doing this is to make money, and if you aren’t then there’s no point; keep your ROI high, and always watch the data coming in so you can make tweaks when you need to; this is the key to a successful paid search campaign. In a way, paid search is one of the most potentially profitable measures you can take when it comes to digital marketing. Because the ads you pay for show up at the very top of the SERPs (meaning you don’t have to worry about being buried under hundreds of other results) and because you can use keywords to directly target the audience you wish to attract, you have the chance to make paid search an extremely profitable endeavor indeed. People have made millions off of paid search on search engines and social platforms, and this isn’t restricted just to Google. With Facebook’s treasure trove of user information, allowing for easy audience targeting, and a growing amount of users on Bing (in addition to very sophisticated ad targeting software), you can increase targeted traffic in addition to your profit margins very, very quickly. However, that does not mean paid search is easy; in actuality, paid search is extremely risky and difficult as it requires a bit more financial know-how, risk taking, and—unfortunately—money. As we talked about earlier, quite a lot in paid search marketing depends upon how much money you are willing to invest into your campaign; in other words, the more money you invest, the better chance you’ll have some quantifiable results. You can invest a low sum into a paid search campaign, but chances are you won’t get much back for it and you might find yourself wondering if you could have spent that money better. Make sure to use a keyword search tool to choose the keywords that work for you. Tools like Google Keyword Planner are fantastic for finding the right keywords that have the best chance of improving your ROI. Write your ad copy with as much care as you would when writing your Meta title and tags. This is the hook that will get people to click and visit your website once your ad is actually visible; don’t let the opportunity pass you by. Don’t forget the Long tail terms when choosing your ad keywords. These will appeal more specifically to people and will improve your targeting as well, giving you more clicks and a higher rate of conversions. Use local terms to attract people and clicks from your region, especially if you have a brick and mortar locale. In the end, just think of paid search as an investment. You are investing in certain keywords and ads, hoping that some will work while knowing with some certainty that others will not. But, if you continually tweak your ad copy, change what you are bidding, fix the keywords that you’ve chosen, and do all you can to ensure your ads are the best that they can be, you will make money on your investment. Paid search works, you just have to know what you’re doing and do everything you can to make it work for you!